Cute 1046sf chalet-style 2 Bed/2 Bath/2 car garage built in 1978 and extensively remodeled with new windows, kitchen, carpet, stucco, etc. in early 2000's. Enter into cozy great room with high tongue and groove vaulted ceilings, ETS heater and propane fireplace. Kitchen has wood laminate flooring, stainless fridge and dishwasher along with electric range/oven. Laundry/utility room at the back has a bonus shower. Exit the kitchen to a 200sf south facing covered deck with amazing valley views - a perfect place to enjoy summer evenings. Main floor also has guest bed with views and privacy and a full bath. 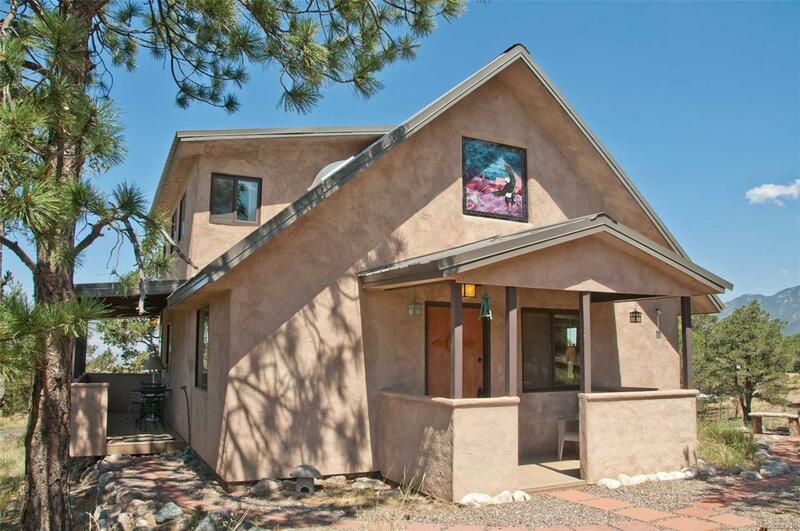 Upstairs is the Master Bed and full bath with a sitting nook and panoramic valley views. Property comes with 1.62 acres and detached 2-car garage with lots of room for storage. Very nice grounds. 297 Palomino is right off of Camino Baca Grande - a paved 5-min drive to town.